It is a simple and quick preparation: let's start by frying in a little amount of oil the garlic cloves, previously pressed, and the anchovies, after removing the excess salt. Mix them with a fork, in order to undo them. In another pan, fry the black olives and the aubergines previously cut in rounds. In the meanwhile, in a third pan, toast the grated bread. Keep an eye on the spaghettis while they're cooking and drain them al dente. 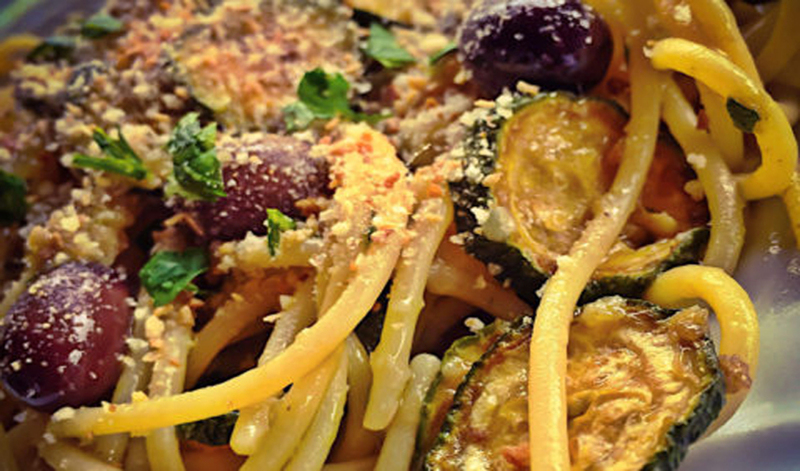 Continue mixing the spaghettis with the anchovies sauce, add the olives, the aubergines and the grated bread. Leave the savours combine together on low heat. Serve on a plate, adding some raw oil and a hint of parsley that you will mince at the moment.